SCH Creative & Performing Arts Inc. is looking for Youth who wish to “Maximize Their Artistry.” Have you always enjoyed writing songs by rapping or singing? Do you want to experience writing songs and recording them in a studio? Have you ever wondered what it really takes to be a successful Artist? Then, this is the contest for you! SCH CAPA will give 8 students the opportunity to work on their talents and gain hands on experience and knowledge. Industry professionals will also be special guest at our workshops. So show us your best because we want to see what you’ve got. You have potential and you don’t know what you’re capable of until you give it a try. 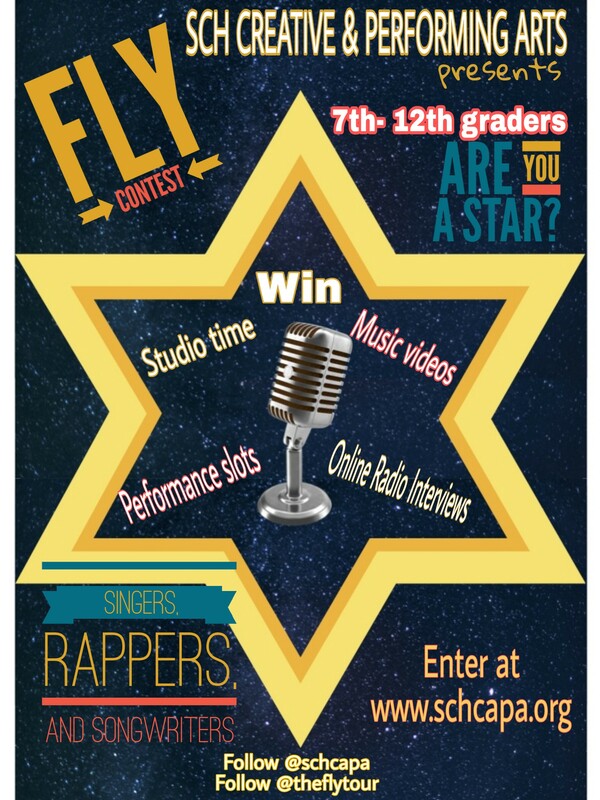 Register for the Fly Tour Contest, upload a video on youtube of you singing/rapping a song of your choice, and email the link to theflytour215@gmail.com. Best videos will post on Allflamerz.com. Read all the details below. Wish upon star! Give it your best shot! Good Luck! A Open House Orientation will be held February 20th at 6:30pm and the program will begin February 27th. The program concludes in July. Classes are held every other Tuesday after-school hours at the Blues Babe Foundation 2233 N Broad St, Philadelphia, PA 19132. Workshops will include topics such as, branding, marketing, Work ethic, what makes you a professional, stage presence, how to protect your music, songwriting and recording techniques, how to get placements, metaphysics of sound and more. Workshops will include speakers from the music industry. All students will be sponsored into the program. Click here to learn more about our founder Suzann Christine. Must attend a school in Philadelphia or the surrounding areas and be able to provide proof of enrollment in a middle or high school, if requested. After you submit your registration form and payment, record a video of yourself performing a song of your choice. If you are a songwriter feel free to have a singer perform a song you wrote for you. Be sure to show yourself in the video. It is ok if this your first time songwriting. Upload your video to YouTube and send your Youtube link to TheFlyTour215@gmail.com. You must have a gmail account to upload videos to Youtube. YouTube videos MUST be titled “I Am Fly ft. (your name)”. Videos may be judged live on Allflamerz.com by professionals in the Philadelphia Music Industry. If you’re “Super Fly” you will receive an email that you’re selected as one of our “Fly Stars”. Please complete this registration form to enter.